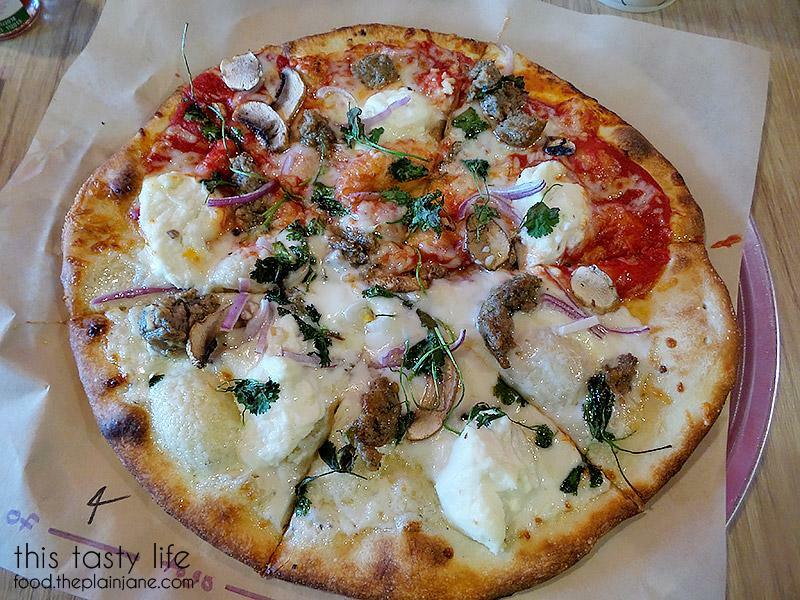 Last Friday I checked out a brand spankin’ new spot that just opened in Mira Mesa called Pizzanometry. My co-workers and I were down for a little bit of pizza creating so off we went! 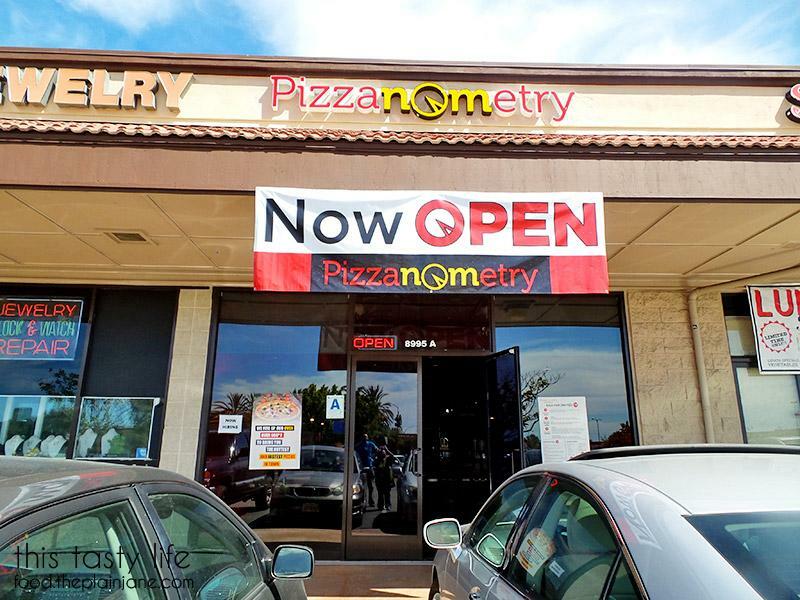 I just noticed Pizzanometry in the McDonald’s/Rite Aid shopping center last Monday. It’s right next to Siam Nara. It’s in the spot that used to be D&C Tofu House which closed in February. I was surprised to see a new spot had opened up since there’s no signage on the street for it and I didn’t realize that D&C had closed. They are currently in their “soft opening” stage while the staff learns the tricks of the trade. When we arrived there were only 2 other people eating here. I think one person wandered in while we had our lunch and we saw many people stop in front but they didn’t come inside. There’s a good amount of seating in here. To the left of this photo, there are a few extra tables as well. 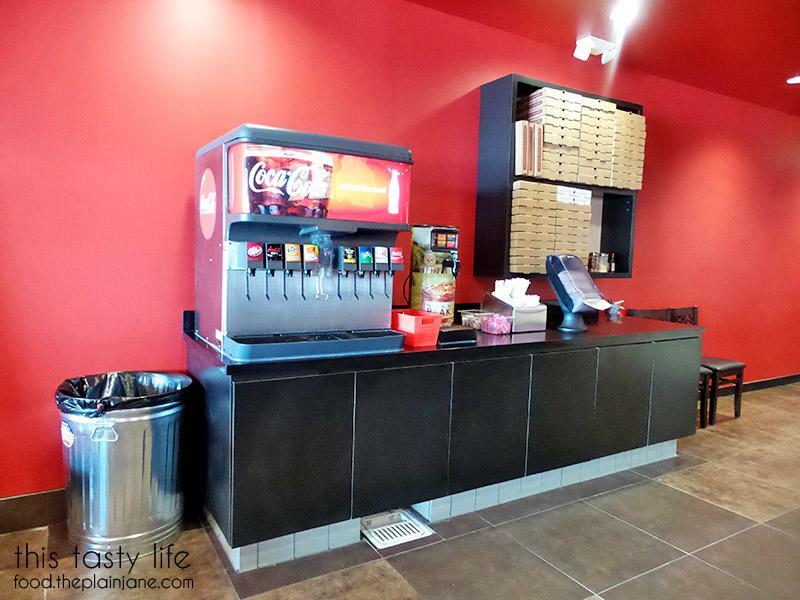 Drink machine and take out boxes in case you can’t finish your pizza. 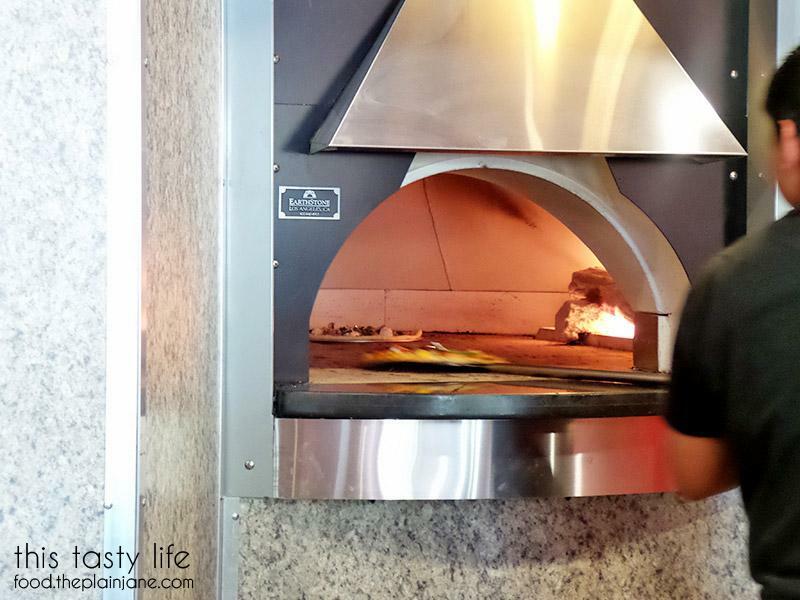 At Pizzanometry have a similar method to prepping the pizza dough as PizzaRev. 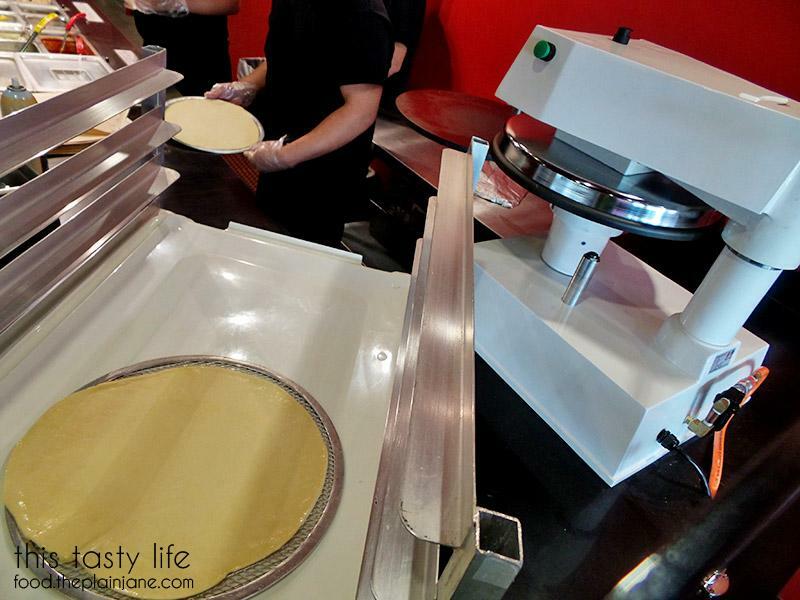 There’s a machine that flattens out the dough for you. 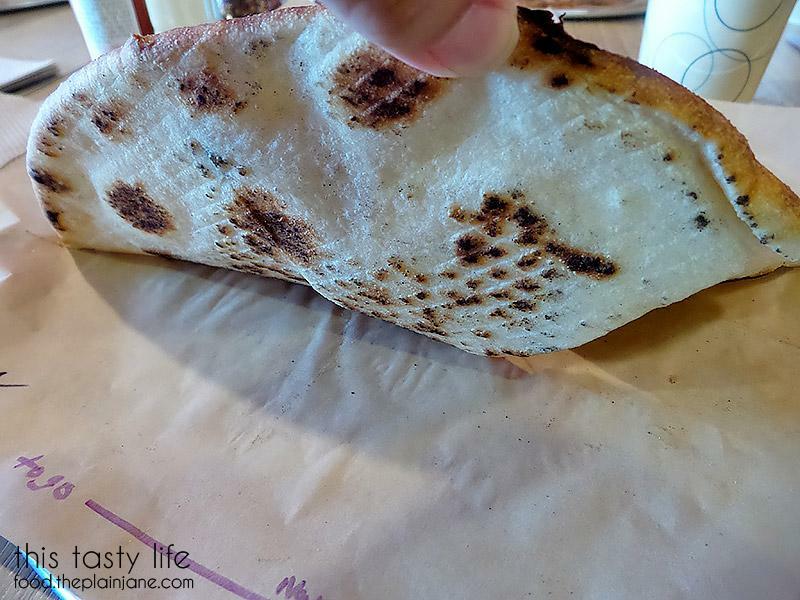 Someone sprays the dough with cooking spray before it goes into the magic crust machine and then it comes out perfectly flat, round, and ready for toppings. 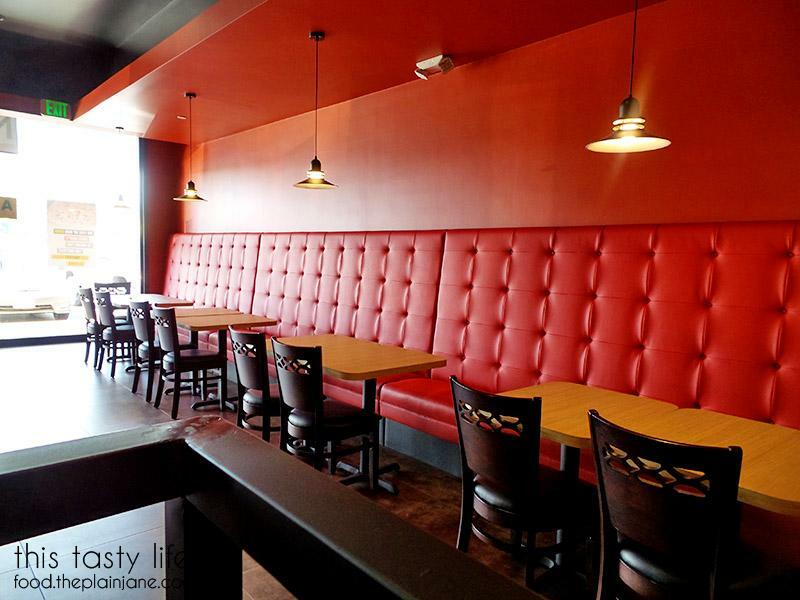 All pizza creations at Pizzanometry are a mere $7.99 per pizza. They have a few select “Signature Pizzas” available if deciding on toppings is too overwhelming for you. However if you like customizing things to your liking (like I do) then Building Your Own Pizza is the way to go. They had three different sauces available that day: a red marinara sauce, a white sauce, or a cheese sauce. You can also order a “pink sauce” which is a mix of red and white. On the menu there is also going to be BBQ sauce and hot buffalo sauce available. For cheeses, you can pick mozzarella or fresh mozzarella (which I didn’t realize until it was TOO LATE), ricotta, feta, parmesan, gorgonzola, asiago, and sharp cheddar cheese. 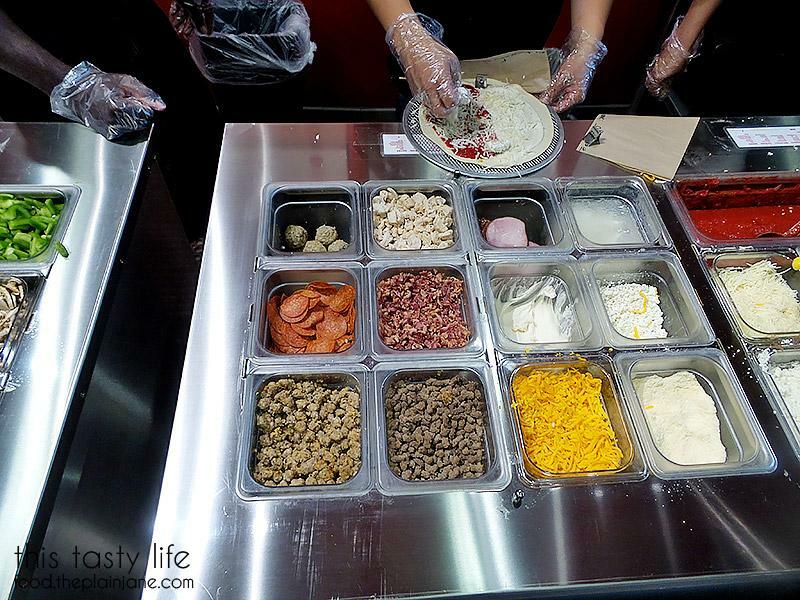 The meat toppings that are available are: meatball, grilled chicken, ham, bacon, ground beef, Italian sausage, and pepperoni. There are lots and lots of veggies available! There are sautéed onions and red onions, artichokes, spinach, sun dried tomatoes and regular tomatoes, a bunch of other vegetables. There are lots of options here. Additionally they had roasted garlic as well as regular garlic! Yum! It looks like the stuff on the left is “to go” items or additional toppers. I’m not sure! A little overview of what’s available on their menu. Your creation gets popped into the oven. And bakes until done. It doesn’t take very long for the pizza to cook. 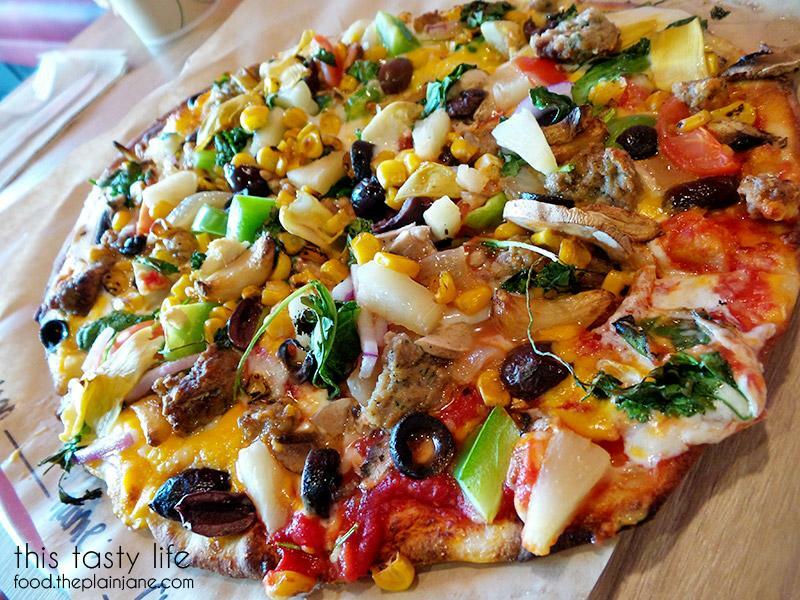 I told the owner after I ate my pizza that I like my pizza to be a bit crispier and he told me that the pizza can be ordered “well done” – they’ll customize it to your liking, all you have to do is ask! 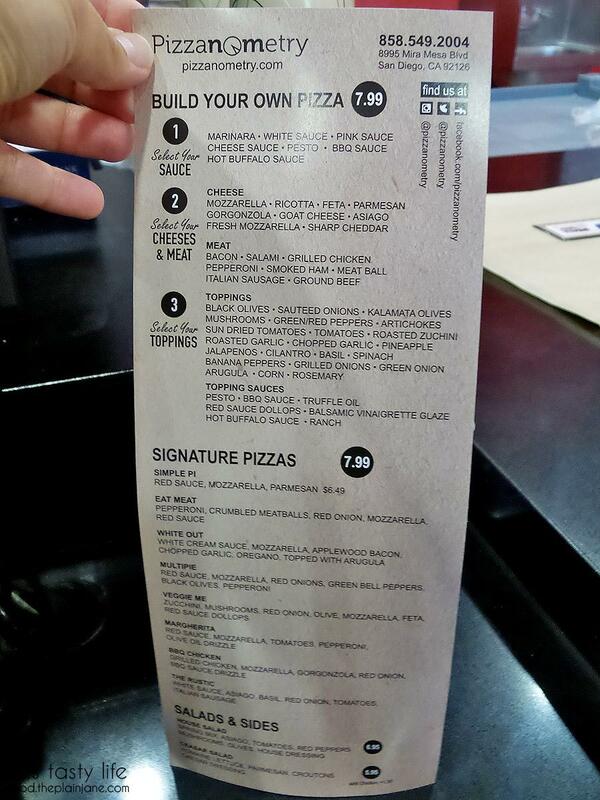 There isn’t signage for it yet but you can also get a “topping sauce” after your pizza comes out of the oven. That day they only had truffle oil, BBQ sauce, and pesto available though the menu also lists red sauce dollops, balsamic vinaigrette glaze, hot buffalo sauce, and ranch. 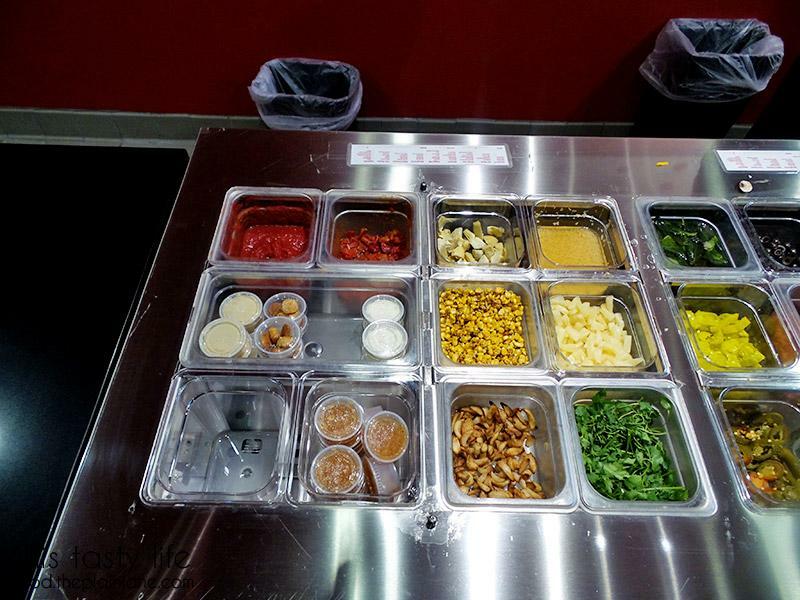 They are still working on the topping sauces for now so that might change in the future. Here’s the pizza Matt created. He got the “pink” sauce with the red and white sauces mixed together plus cheddar cheese and other goodies. 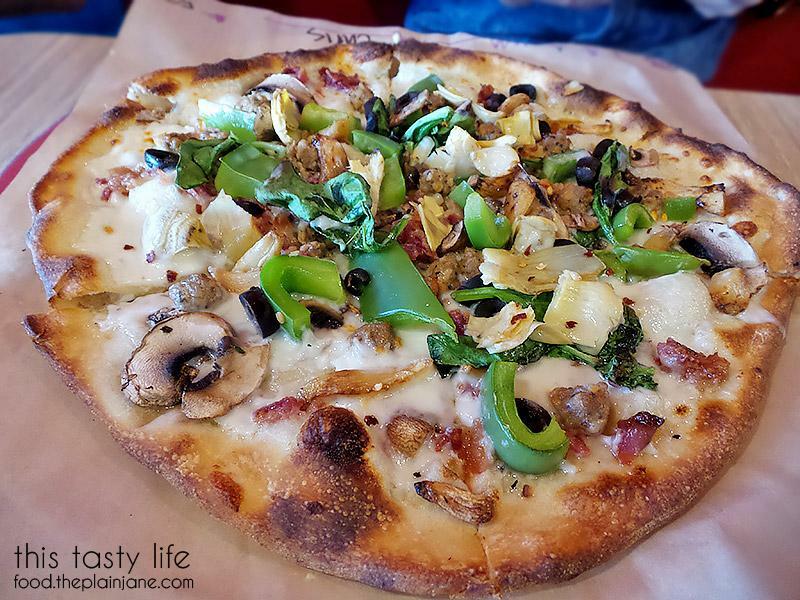 Chris went for a white sauce pizza with lots of greens, bacon, sausage, mushrooms and other bits. 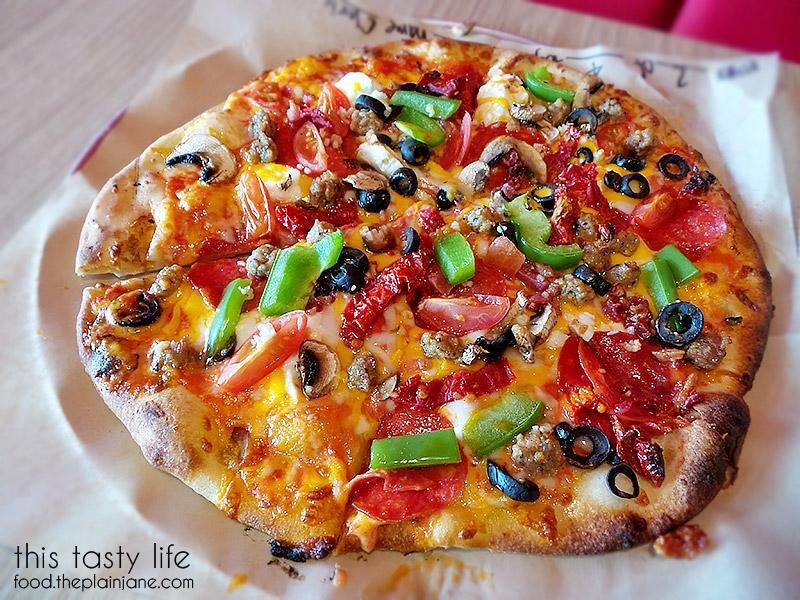 Cris’s creation took the longest to come out as she super-customized her pizza. She asked for all three sauces! 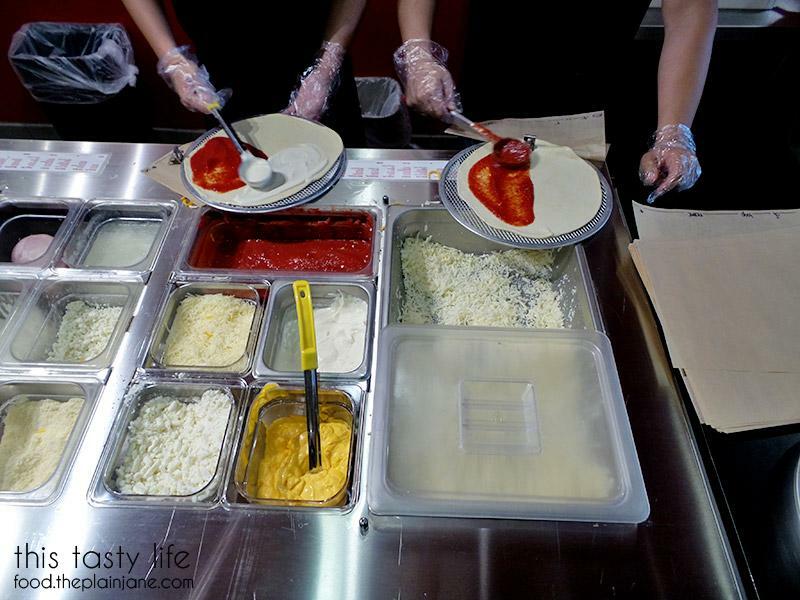 The girl making her pizza was very carefully spreading the sauces out into three section on her pizza. I remember overhearing her ask for 1 pepperoni slice. Hah! As for me, I’ve learned from past experiences to go simple. Getting lots of ingredients tends to weight the pizza down and I’m a big believer in “less is more” when it comes to pizza. For my pizza creation, I got half marinara sauce and half white sauce topped with mozzarella cheese, dollops of ricotta cheese, mushrooms, sausage, garlic, and a little bit of cilantro with a drizzle of truffle oil at the end. The cilantro sadly got very crisp from the heat of the oven and didn’t taste all that great. The owner said they would experiment and see if they could find a way to keep the cilantro from drying out while in the oven. I suggested that it might be a good “finisher” item along with the basil so they don’t get dried out while cooking. We’ll see what they do with that in the future! The rest of the flavors of the pizza were excellent. I’d only say that the truffle oil on top of the white sauce is a bit too rich and heavy. The truffle oil tasted much better on the marinara half of my pizza. The crust had a nice chew to it with a little bit of char on the bottom. There were no soggy middles and I was happily able to pick up my slice with no issues. I still would have liked it a touch more crispy so I was happy to find out they could do that if you ask for it – hooray! 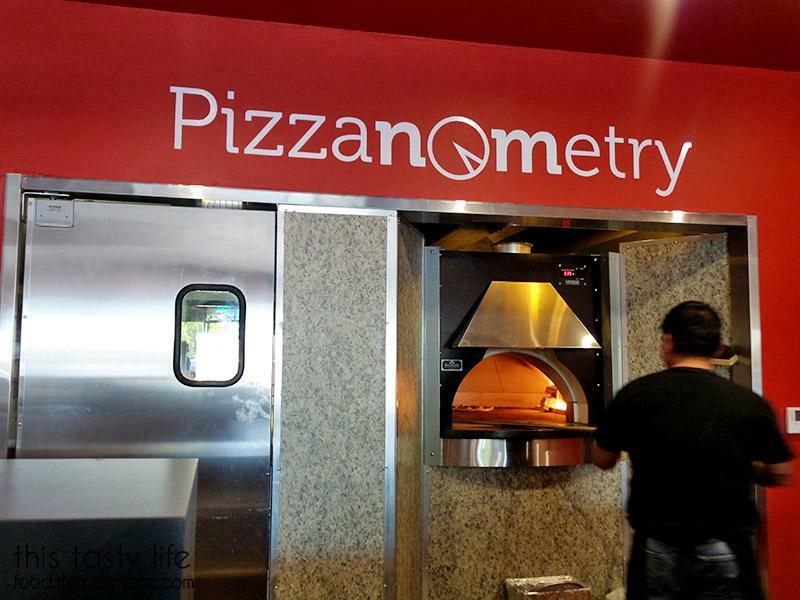 I will definitely be back to see how Pizzanometry progresses. I enjoyed the pizza and the price point is excellent – only $7.99 for your own pizza! This eliminates having to share your pizza with anyone and you can get exactly what you want on it. I like that strip mall – there are a lot of good places to eat there (Siam Nara and the VN place next to it). I wonder what the next food craze will be (seem like it’s poke); since customized pizza is kind of out. 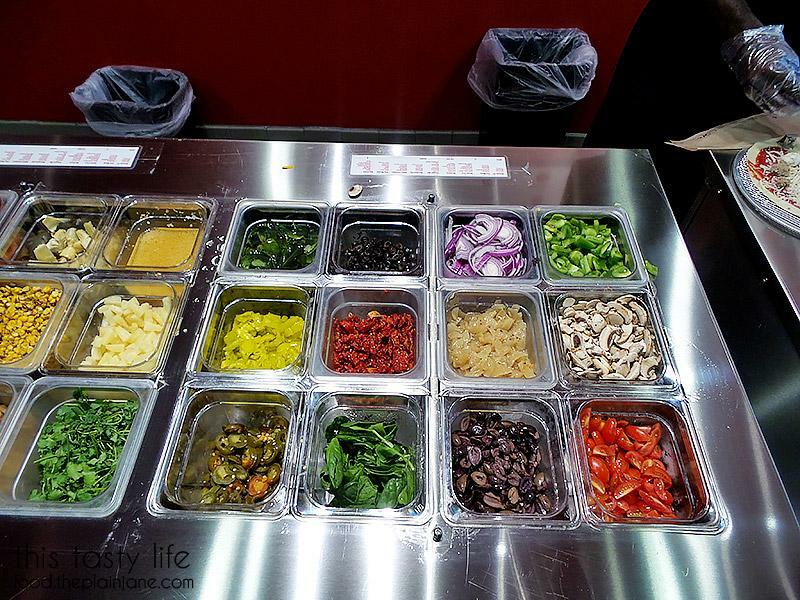 Despite that, I still like the fact that you could pick your toppings, sauce, crust, etc for a good price point! 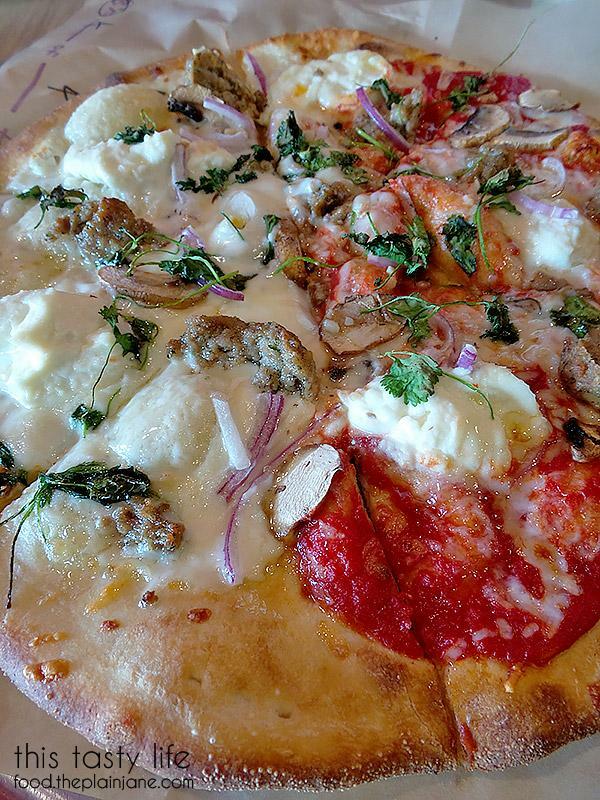 Hi CC – The price point is excellent for getting your own little pizza. I like that there are plenty of options! Bale Sandwiches is also in that strip mall now – it’s the same as the Bale place over by Big Lots and Donut Stop but with more offerings. I’m hoping to check it out soon! I do think Poke may be the next “thing” but that’s not something I’m into. We’re getting a bunch of new things in Mira Mesa soon so I’m excited – Crab Hut just opened plus Luna Grill and 85C is coming soon! Hi Lynn – Yessss! 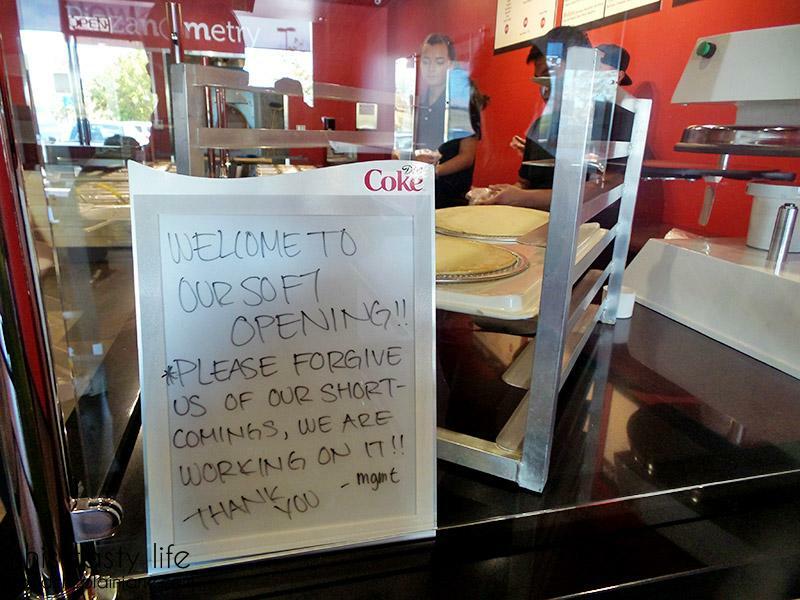 PizzaRev is close but not really close enough if you ask me – ha! I figured that Tofu House took away the business of D&C. Tofu House was a bit easier to see from the street, too. Maybe that also had a little something to do with it. This new pizza spot is really close by so I can see myself going here more often.